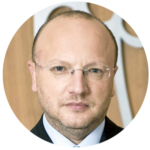 Vincenzo Boccia, 54 years old, since May 2016 President of Confindustria, is the CEO of Arti Grafiche Boccia, Italian company operating in the graphic industry. He started his commitment in Confindustria since the early 90s being Member of the Young Entrepreneurs Mouvement. In 2003 he was President of Confindustria Assafrica & Mediterranean and later Member of the Council of Assografici. From 2009 to 2013 he was President of Piccola Industria, the organization for SMEs development and growth, and Vice President of Confindustria. Until May 2016, he led the Technical Committee for Credit and Finance.